We're finally dipping below £150 with our Z390 coverage, and also below the ATX form factor as we take a look at the first mini-ITX Z390 board to enter our lab. MSI is up first with the rather complicated name of the MPG Z390I Gaming Edge AC. Coming in at around £135, it's actually one of the more affordable options at this form factor for Z390. Unsurprisingly Asus' ROG Strix Z390-I Gaming comes in at around £80 more, while Gigabyte's Z390 I Aorus Pro WiFi retailing for a more mid-range £160, making the MPG Z390I Gaming Edge AC the cheapest of the bunch. However, specifications vary significantly between the boards, and MSI's goal has clearly been to reign in the features to attain a lower price tag. 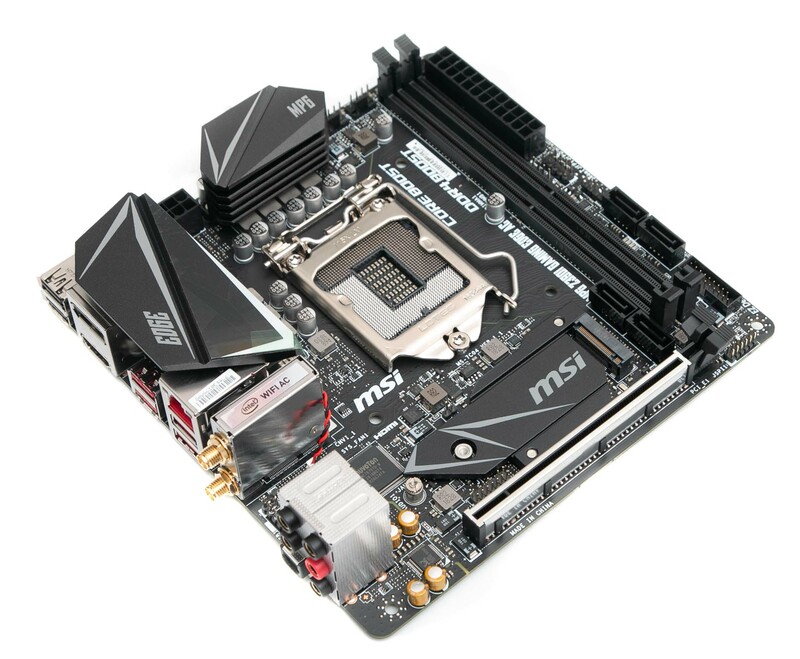 The most obvious omission is an M.2 heatsink, which we were surprised at due to MSI being the first to include them on its motherboards. With mini-ITX systems often being cramped, every bit of extra cooling for hot-running components is quite useful, but at the very least it hides the often unsightly stickers on M.2 SSDs. There's no USB Type-C header on the PCB - something both the aforementioned boards are equipped with, in addition to RGB lighting, which is again absent on the MSI board bar a single RGB header. It matches the other boards with four SATA ports and a pair of M.2 ports, with the one located on the rear of the PCB being limited to just PCIe SSDs and the front-mounted port catering for both SATA- and PCIe-based models. The main issue we have the top M.2 slot lacking a heatsink, though, is that it looks decidedly odd - as if it should have had one but MSI forgot to put it in the box. In fact, we actually searched the box for one for a couple of minutes until we saw the online photos confirmed it simply doesn't have one. It's yet another feature that the Gigabyte board has. The list continues as we move to the rear I/O panel, which has Realtek ALC892-based audio, rather than ALC1220 on the Gigabyte board. The latter also has Intel and not Realtek-based Gigabit LAN plus a USB 3.1 Type-C port here too. However, unlike many boards we've seen that cut the audio in this way, MSI has at least installed the full complement of audio jacks, plus you do get 802.11ac WiFi.